Today is Mardi Gras! Fat Tuesday! If you haven't already indulged in Pancakes (it's also Shrove Tuesday), you might want to try these Mardi Gras Treats! Sugared Chocolate Beignets are perfect for Mardi Gras! Lara Ferroni has a great recipe for Beignets with Fudgy Chicory Coffee Sauce! 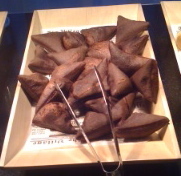 The other day I had Chocolate Bugnes at the Hotel Sofitel. These were wonderful classic French Mardi Gras treats that originated in central-Eastern France (not necessarily chocolate). They're closely relgated to beignets, so they're perfect for Mardi Gras! Here's a recipe from O. Buisson. Haven't made these, so if you do, let me know. I've only tasted the ones at the Hotel Sofitel, and they were fabulous! Want something else that embraces Coffee & Chicory? This is a fabulous recipe that reflects New Orleans cuisine: Chocolate Cupped Cakes with Coffee & Chicory? Mardi Gras is full of coins and beads, and you've got to to to HungryHappenings to find out how to make fabulous Chocolate Truffle Beads! Mardi Gras isn't complete without King Cake, but I don't have any recipes for Chocolate King Cake. Another Louisiana/Alabama favorite cake is Doberge Cake (pronounced alternately as “DOUGH-bash”, “Doh-BAREzh” and as “Dow-BAWHzh”), and here's a recipe adapted from Mardigrasday.com for Chocolate Doberge Cake! Just an FYI: Doberge Cake is a very popular Birthday Cake in the New Orleans area. Preheat oven to 300 degrees F. Grease and flour 2 nine-inch round cake pans. In a medium bowl, sift the flour, soda, and salt 3 times. Cream the margarine and sugar in a large mixing bowl, and add egg yolks, one at a time. Gradually alternate adding the flour mixture and buttermilk, then add chocolate and mix well by beating about 3 minutes. Fold in the 3 beaten egg whites, vanilla, and almond extracts. Bake for 45 minutes or until done. After the cake cools, split each layer in half to make 4 thin layers. To make the filling, put milk and chocolate in a saucepan and heat until chocolate is melted. In a bowl, combine sugar and flour. Make a paste by adding hot milk chocolate by Tablespoons to the sugar and flour, then return to saucepan. Stir over medium heat until thick. Add 4 egg yolks all at once and stir rapidly to completely blend. Cook 2 or 3 minutes more. Remove from heat, and add butter, vanilla, and almond extract. Cool and spread on cake, layering as you go. Do not spread on top layer. For frosting, combine sugar and milk in a heavy saucepan, and bring to a boil, stirring constantly. Reduce heat and simmer for 6 minutes without stirring. Remove from heat and blend in chocolate. Add margarine and vanilla and return to medium-low heat, cooking 1 or 2 minutes. Place in refrigerator to cool. Beat well, then spread on top and the sides of the cake. This is a special dessert of Louisiana that's worth every minute of time and effort. Cooking with Herb Absinthe has another recipe for Chocolate Doberge Cake: Check it out here! "Bugnes, Beignes and Beads" could become the new movie title for a Kim Novak comeback to replace her old hit movie, "Bell, Book and Candle"
You can get a chocolate filled king cake at HiDo Bakery in Gretna on the terry parkway.